Aah! Memories of school days: carrying our desks to class ... wait, what? 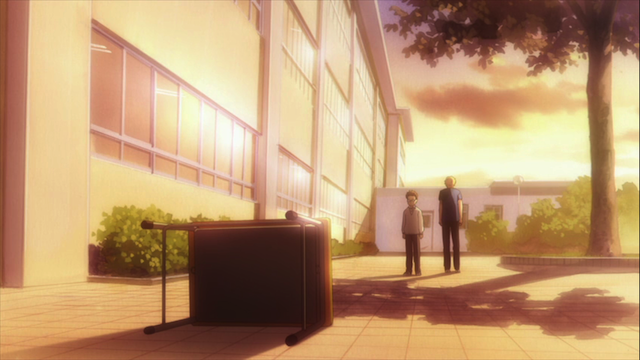 In Chihayafuru episode 7, the hunt for club members continues. 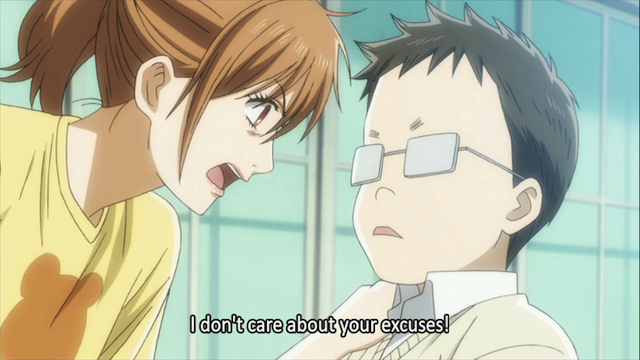 This time Chihaya has her eye on a boy that doesn’t know it yet, but he desperately wants to be saved. In addition to giving us more of Chihaya’s hilariously straightforward character, and a new club member, this episode also provides Taichi with an opportunity to shine. Please consider this jam bread a bribe! 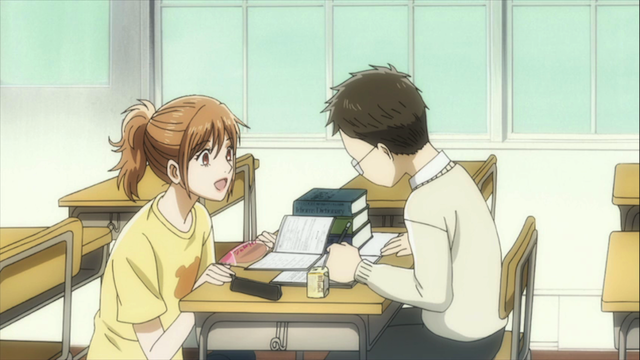 Chihaya Ayase attempts to recruit Tsutomu Komano for the Karuta club. Negotiations start to break down. Not quite recruiting ~ more like kidnapping. Tsutomu is called “Desk-tomu” by others, because he never leaves his desk (that is, instead of getting up to chat with the other kids, he sits there studying). By working so hard, he has managed to take the number two spot in academics (behind Taichi). No doubt Taichi’s presence in the Karuta club is a bit of a mystery to Tsutomu, and he seems to be intrigued by Chihaya’s assertion that Karuta improves the memorization ability of the players. Still, unconvinced Tsutomu demands to see a game played “flipped”, that is where the players cannot rely on the visual clues of the lines of poetry. In "flipped" Karuta remembering where each card is, even with the changes that come through play, becomes the only path to success. 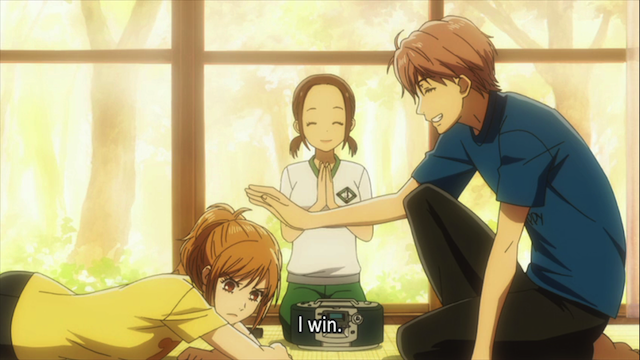 Because Chihaya isn't as good at memorization, Taichi finally manages to win a game. This game demonstrates another aspect of Karuta (well, this was hinted at previously, particularly as Arata’s strength), it also shows that Chihaya has a weakness that she needs to fix to truly become the player she wants to be. 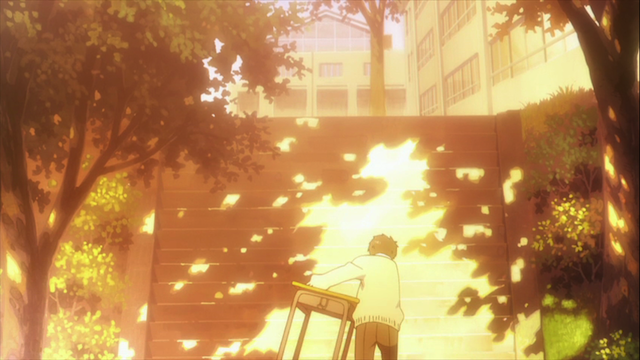 It also did something for Taichi; he had been content to lose to Chihaya, because he was supporting her dream. Having an opportunity to win aroused his own passion for the game. Tsutomu does some soul searching after the match. With a little help from Taichi, he manages to break from the desk to which he had shackled himself. Even after the game Tsutomu isn’t willing to join the club. He argues that he doesn’t have any talent for Karuta. 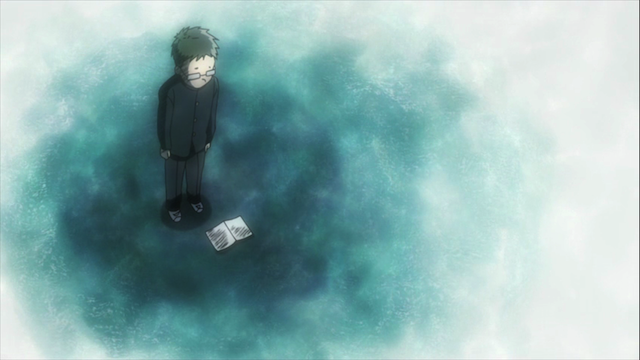 Taichi hears his own voice in Tsutomu’s fear. 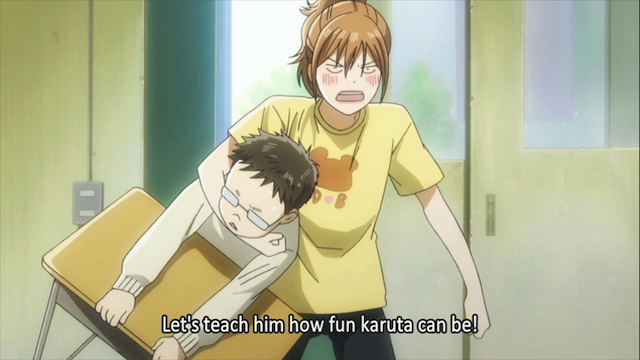 He has struggled because, unlike Chihaya and Arata, he doesn’t have a natural ability for Karuta. He was taught by his parents to give up on things that he wasn’t able to succeed at, but he learned that there was something to trying hard particularly when it doesn’t come easy. Taichi gives Tsutomu the option to go back to sitting alone at his desk, but Tsutomu wisely takes the opportunity to return to the Karuta club instead. 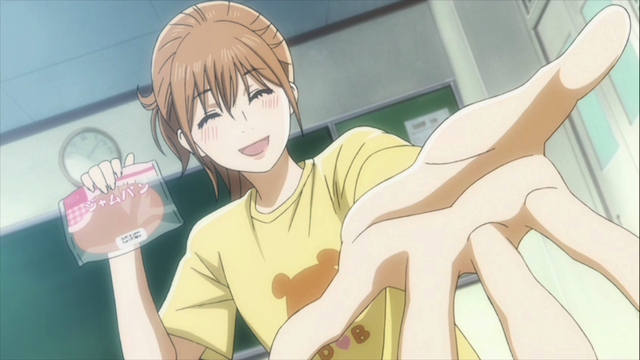 Chihaya Ayase wants YOU to join her for more Karuta club next week! In some respects this episode focussed more on the gameplay of Karuta than recent episodes have. Taichi’s inner monologues, and his explanations to Kanade indicate just how much he knows about the game. 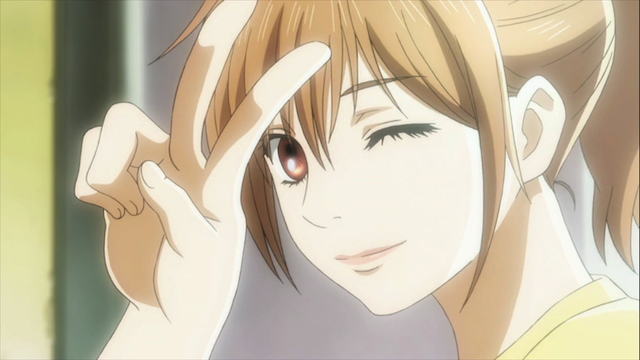 Whereas Chihaya’s approach is mostly physical, relying on her senses and reflexes, Taichi has thought a lot about strategy and tactics and rules. I got so caught up in the “flipped” Karuta game (and Chihaya’s recruiting efforts) that I was surprised when the episode ended so “quickly”. This show continues to stand out as my favorite of the season. Yes, I REALLY enjoyed this episode. So far, each new member has brought a different strength to the team. If Team Chihaya continues practicing “flipped” games, it could bring a quantum level of improvement to their game play. And Chihaya is definitely a little bit crazy. Which is probably an essential character trait of anyone who wants to be “the best” at something. I could see this show and these characters going in so many different directions. It’s fascinating. Definitely my fave. 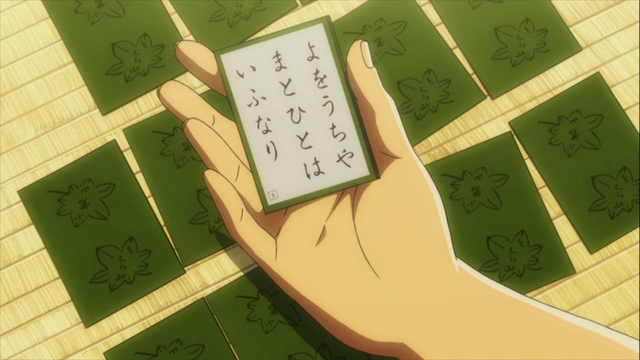 I hope Chihaya comes to understand that she needs to get better at memorizing. It wasn’t quite clear to me if she would fight it or not. I bet Taichi knows some tricks to memorizing the cards that she could benefit from. It is often difficult for people who have a particular strength to accept that they should be strengthening their weaknesses instead of merely relying on their strengths. I’m sure that Chihaya could eventually be convinced to do it, since she is so motivated to be the Queen, but she is also more than a little headstrong, and Taichi is confrontation-averse (especially when it comes to her). this is such an awesome show. just when I thought Karuta couldn’t be even more fascinating, they flip the cards! and this very simple gesture is going to help the players improve leaps and bounds – and it’s given Taichi an edge, rekindling his fighting spirit (in both Karuta and love). it’s amazing how they effortlessly keep Arata involved without him physically being there; I feel like they’re deliberately leaving the “fifth spot” open for him in the Karuta club. it’ll be nice to see the new guy and Oe-san play Karuta too and develop a Chihaya-kind of love for the game. Yeah, I didn’t read the manga either, so everything that happens is a big surprise to me, but it all fits together so naturally that it seems like it was the thing that had to happen all along. Same with the flipped cards this episode — I wasn’t expecting it, but when it happened, and Taichi won, it all made so much sense.